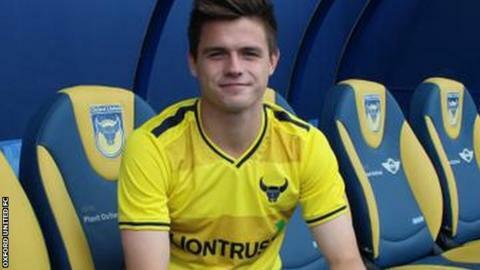 Oxford United have signed winger Jonny Giles after the 21-year-old impressed during a two-week trial with the club. Giles graduated in physics at Durham University in the summer before turning his attention to a career in football. He posted a highlights video of his time playing in the north east online and eventually an agent secured him a trial with the club. "I'm hoping to learn a lot while I'm here from a really talented bunch of players," he told BBC Radio Oxford. Giles played for National League South Maidenhead United as a youngster and while at university, played for Durham and Ashington, who are now managed by former England cricketer Steve Harmison. After arriving at Oxford, he played in development matches against Premier League clubs Aston Villa and Southampton, who included internationals Juanmi and Jay Rodriguez in their side, and showed enough to earn a professional contract. "This is a new chapter for me. I've never played football professionally before so I'm going to try and develop for the first couple of months," he added. "I think I'll improve coming back from training every day and hopefully eventually reach new heights at this club."